Kairi, Sora, and Riku always hung out together. When their island vanished, Kairi lost her heart. It turned out that it was hidden within Sora's. As one of the princesses with the power to unlock the secret Keyhole, Kairi restored Sora's heart when he was turned into a Heartless. Sora’s childhood friend. Sora’s journey began as a search for Kairi, who disappeared when their island home was swallowed by darkness. Kairi was held captive by the Heartless, but thanks to Sora, she and the islands were saved. She waits there for Sora and Riku’s return. Riku and Sora’s friend growing up. Kairi vanished when their home islands were devoured by darkness. Riku and Sora both journeyed to find her. A girl with a Heart of Pure Light, and Sora and Riku's childhood friend. Kairi is originally from the world of Radiant Garden, but was cast out of that world at a young age by Ansem the Wise's apprentice, Xehanort. She reached the Destiny Islands where she met and befriended Sora and Riku as well as Selphie, Tidus and Wakka. She doesn't remember her former home, but that doesn't bother her in the least as she's happy right where she is. When the Islands disappeared, Kairi's Heart fled her Body and found refuge within Sora's. She was saved when Sora turned himself into a Heartless, thus releasing her Heart and letting it return to her own Body. As a result Naminé was born as Kairi's Nobody, using Kairi's Heart and Sora's vessel. Kairi in return used her powers as a Princess of Heart and restored Sora to his human form by purifying his Darkness. The two parted shortly afterward as Sora left to save Riku who was trapped in the Realm of Darkness, leaving Kairi behind on the Islands for her own safety. Sadly, Kairi forgot Sora along with everyone else who knew him when Sora went to Sleep. She was one of the first to regain her Memories of him, however, when Naminé came into contact with Roxas, Sora's Nobody who was born when Naminé was. As a result, Kairi and Sora's Hearts came into contact with each other and Kairi remembered the boy she grew up with. Happy beyond words, Kairi sent out to sea a letter in a bottle she wrote to the boy she couldn't remember. Being left with no choice but to wait for Sora and Riku to return left Kairi frustrated. A member of Organization XIII called Axel tried to use that feeling by promising Kairi he'd take her to meet Sora, but she escaped into a Corridor of Darkness opened by Riku. Kairi managed to catch a glimpse of him before appearing in Twilight Town where she met Hayner, Pence and Olette. Unfortunately, Axel found her in Twilight Town and kidnapped her, only to lose her to Organization XIII. She was held hostage in order to fuel Sora's anger, but was thankfully saved by Naminé. The two were soon reunited with Riku who saved them from Saix, and Kairi then learned the sad truth of her friend's fate - he had transformed into Xehanort, the same villain who once kidnapped her and the other Princesses of Heart. Kairi managed to accept Riku despite his appearance and together they fought the Heartless that stood between them and Sora. Surprisingly, Kairi managed to use the Keyblade Riku gave her and finally received her long awaited reunion with Sora. Riku turned to leave then, but Kairi called out his name. She was the one who made Sora listen to his Heart rather than his eyes and realize who was standing right before him. She was thankfully unharmed during the final battles and returned to the Destiny Islands while Sora and Riku fought Xemnas for the last time. It was the letter in a bottle she sent before that brought the two boys home at long last from the Realm of Darkness, and the girl was there to welcome them back with a wide, warm smile. Childhood friends with Sora and Riku. She was once targeted by the forces of darkness for being a Princess of Heart. Back at Destiny Islands, she waits for Sora and Riku’s return. A young girl with a heart of pure light. Kairi was born in Radiant Garden where she lives with her grandmother. While picking flowers one day, she is attacked by a group of Unversed. She runs into Aqua and accidentally touches Aqua's Keyblade, unintentionally initiating a Keyblade Inheritance Ceremony. King Mickey suddenly appears and tells Aqua that they must protect the girl. The King and Aqua fight together to defeat the Unversed. After the battle, the King introduces himself properly as Yen Sid's former apprentice. He and Aqua talk about how special Kairi is because of the light in her heart. He suggests that the two of them team up, but his star shard activates by itself again and he is transported unwillingly to another world. Kairi gives the flowers she picked earlier to Aqua to thank her. In exchange, Aqua places a protective charm on Kairi's necklace so that her light will lead her to the light of another should she run into trouble one day. Kairi thanks Aqua and runs to her grandmother who was looking for her. The young girl asks her grandmother to tell her favorite story about the light and darkness again. At the end, Kairi is seen picking flowers again and looks up to the sky while her necklace gently glows. When Sora makes the decision to depart on another journey to save those who so desperately await his help, Kairi smiles knowingly, as if expecting this turn of events, and once again, leaves her lucky charm in his care. Sora and Riku's best friend, and one of the seven maidens whose heart is made of pure light. Kairi waits on the Destiny Islands, eager for Sora and Riku to return after they've passed their Mark of Mastery Exam. However, once Master Yen Sid learns that Xehanort is looking to instigate a second Keyblade War, Master Yensid summons Kairi to his tower to inform her of the Seven Guardians of Light and to begin her training as a Keyblade weilder. 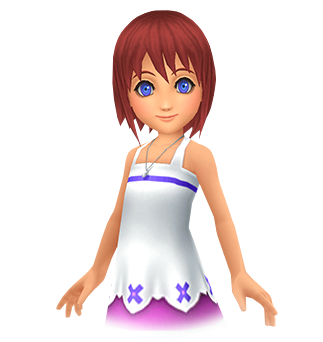 A Princess of Heart who hails from the Radiant Gardens, Kairi is best friends with Sora and Riku. With the ability to summon a Keyblade, Yen Sid tasks Riku with bringing her to his Tower in order for him to instruct her on her training. Kairi listens to the story of the lost Keyblade Master Aqua, a person she encountered over a decade ago, and asks Yen Sid how she can help. Yen Sid informs Kairi that she will be sent to train with Lea under the supervision of Merlin. Despite reservations about training with Lea, a man who kidnapped her when he was a Nobody, she goes off to train in order to become a Keyblade Master. One of the Seven Princesses of Heart and a Keyblade wielder. Originally from Radiant Garden, Kairi was sent to the Destiny Islands by Ansem the Wise during the fall of the City of Light. She was guided by a charm around her neck that, a year before the fall of the world, was charmed by Master Aqua. After landing in Destiny Island, Kairi was raised by the mayor and became friends to Sora, Riku, Tidus, Selphie, and Wakka. At the age of 14, she was curious about her homeland and came up with a plan to sail away from the islands in search of other worlds. The plan was cut short when the world was overrun by the Heartless, and her heart took refuge in Sora's. Her heart was eventually returned to her body after Sora sacrificed himself in Hollow Bastion. As a Princess of Heart, Maleficent and Riku had collected the Seven Princesses of Heart in order to open the Door to Darkness, however the gathering failed as Kairi's heart was absent. With her heart's return, the Keyhole to the Door to Darkness was opened, and the other Princesses of Heart use their powers to hold the Darkness back. When Sora defeats Ansem Soul of Darkness, Kairi is returned to the Destiny Islands where she waits a year for Sora and Riku's return. However, due to the meddling of the witch Naminé, Kairi forgot about Sora until a chance encounter with Roxas, Sora's Nobody. It is then she decides that she is done waiting for the boys to return. Axel, the eighth member of Organization XIII, goes to the Destiny Islands in order to capture Kairi and use her as bait against Sora. Kairi runs into a Corridor of Darkness and is guided by Riku to Twilight Town where she meets Hayner, Pence, and Olette. Some time later, Axel tracks Kairi down and takes her to the Organization's stronghold. Sora infiltrates The World That Never Was in search of Riku and Kairi, however the two had already reconnected, thanks to Kairi's Nobody Naminé. It is here that Kairi's long dormant Keyblade Wielding powers are awakened when Riku hands Kairi the Destiny's Embrace Keyblade. With Xemnas' defeat, Kairi is sent back to Destiny Islands with Sora and Riku. Their peace doesn't last long, as King Mickey sends a note to the three Keyblade wielders. Sora and Riku rush off to the Mysterious Tower while Kairi is left behind. After learning about Master Xehanort's true plan, Yen Sid sends Riku on his first official missions as a Keyblade Master - to retrieve Kairi from Destiny Islands and bring her to the Mysterious Tower. It is here that Kairi learns about the fate of Master Aqua. Kairi tells Yen Sid that she would like to help, and the retired Master instructs her to go to Merlin and train in the ways of the Keyblade alongside Lea, the revived form of Axel. Kairi is hesitant to train alongside Lea, due to the kidnapping, however a bond between the two is quickly formed, no doubt thanks to Lea's dorment memories of Xion.